Toccoa means "beautiful" in the Cherokee language and it really is all in a name. 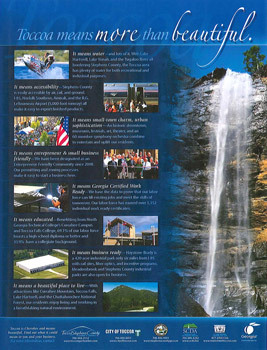 In addition to its natural beauty, Stephens County has all the ingredients necessary to make your business succeed: a world-class business park, a well-developed infrastructure, a strong work ethic, a skilled and educated workforce, abundant water, a progressive-minded community and cooperative city and county governments. Let us show you why it pays to invest in Stephens County and Northeast Georgia. As long time business owners in Toccoa, we have found the Stephens County Development Authority to be an invaluable resource. This year, especially, as Maple Ridge purchased a new facility and expanded, Tim Martin and the entire SCDA was there every step of the way assisting us to make the purchase and move as seamless as possible. We are proud to do business here and thankful for a great community of support. A couple of years ago, the Stephens County Development Authority informed us that we were located in an Opportunity Zone which qualified us for tax credits that were applied to our GA payroll taxes for adding new employees. We were able to realize these savings. We are thankful to our local development authority for making sure that we were taking advantage of all the tax credits available to us. 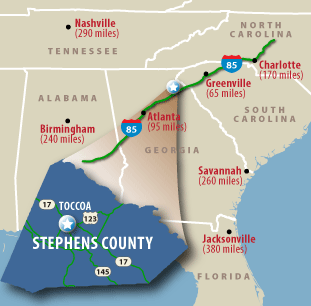 From the beginning of our interest in moving to Toccoa-Stephens County, the Stephens County Development Authority made regular trips to our office to make sure we are adjusting to our new home and acclimated to the community resources in Stephens County. They provided a wealth of information on Georgia Business Incentives and tax incentives specific to Stephens County. They introduced us to many connections in Stephens County. We now are well connected with the Department of Labor and attend their monthly meeting and after SCDA's help with some paperwork we have taken advantage of GDOL's Incumbent Worker Program. The Development Authority also shared their long list of local vendors with us and we were able to find our utilities provider, an insurance agent, a computer technician and research local CPAs. Basically, the SCDA is our go to. If we can't figure it out or just need some guidance on an issue we don't hesitate to pick up the phone and call. We definitely appreciate the Stephens County Development Authority's efforts to make Toccoa a great place to do business. They truly make us feel welcome and appreciated in Stephens County! When we began looking for a site in the Southeast...North Carolina, South Carolina and Georgia, the 'Peach State' represented the best value in terms of business climate, taxes, transportation costs, land values and standard of living. An added incentive was a building available for immediate use that suited or needs, but the clincher was the welcoming environment created by Stephens County and The City of Toccoa business and government officials and the Stephens County Development Authority. We feel at home here. We don't feel like strangers and we want to be a part of our communities and within our region, that's a very important principle to us. The Stephens County Development Authority has been a wonderful resource for PTL Equipment during a period of growth for our company. Tim Martin was able to guide us to the right individuals in our community to achieve our goals and establish stability through our building project. I am thankful the folks of Stephens County have this resource available to them. We at NIFCO KTW are proud and feel very fortunate to have found Toccoa in Stephens County as the home of our new U.S. headquarters and production facility in North America. Local and regional connectivity is the basis for our success in Germany and we strive to do the same in the U.S. We would like to offer our qualified and motivated employees pleasant and attractive surroundings. In the City of Toccoa, we have found the perfect partner in North America for this goal. There was not a single person or aspect that played a large part in locating to Toccoa. We found there are many in Toccoa. The city is a little like our hometown in Germany- a rural area, beautiful landscape, but with everything you need for your daily life. Tim Martin, Stephens County Development Authority Executive Director, is also the guy who helps us in every situation and has from the very beginning until today. NIFCO KTW looks forward to becoming a reliable and successful employer that contributes to positive economic development in Stephens County. I have owned and operated a business in Stephens County over the last 30 years and I am confident that I would not want my investment to be anywhere else. The entire community is very business friendly. I can always count on timely responses from the government entities whether I am working on permitting issues or have a question concerning a tax bill. The Stephens County Development Authority’s commitment to connecting existing industries with other existing and or new industries to our area has enabled us to gain relationships that have led to a network of valuable resources for us. Their commitment to sharing valuable information with us through their existing industries email blasts has helped us stay informed with new and updated policies that affect our industry. MWL, LLC has also gained several local costumers thanks to referrals by the Stephens County Development Authority. The Stephens County Development Authority has has been uniquely helpful in a number of instances over the last 5-6 years. When we needed rental space in the last few years they were able to provide contacts for several valid nearby options. When we wanted to compare notes with other local industries, executive director Tim Martin dug into his Blackberry and came up with every contact we needed. When we needed attention from the county administrator/leaders, they were quick to step in as our advocate. As we close in on 30 years in the Meadowbrook Industrial Park, we are not 'new' industry, but we feel well supported by the Stephens County Development Authority! Thanks. We love working for ASI Southeast and in Stephens County. The entire process from starting the design through working with all of the governing agencies has been a great experience. We were honored to have been selected for this project and look forward to further opportunities to serve the area. It has been a privilege working with the Stephens County Development Authority on the construction of the 155,000 square foot automotive injection molding facility for Stephens County's newest industry, Nifco KTW. They are by far one of the most fantastic development authorities I have ever worked with.